Hello and welcome to Chris' Old Life Magazines. Thank you very much for stopping by. My name is Chris Palmer, I am the owner, president, warehouse man, office person, shipping and receiving guy and janitor among many other things. 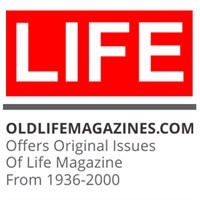 I have been in the Life Magazine business since 1990 where I started with my first batch of 1200 Life issues which I bought from an estate. I started selling in an antique mall in Southern California where we lived at that time. My wife and I now live in Knoxville, Tennessee. This site was started in 1996 and was a part time venture for a number of years. About twenty years ago it evolved into my fulltime job. There are a couple other sites that sell issues on the web. I guess the quote "Imitation is the Greatest Form of Flattery" is true. These sites have scoured my site and tried to copy just about everything I have done over the years. Don't be fooled by imitators, I have been selling for many, many years longer than these folks and I sell only complete original 100% guaranteed issues. We have sold issues to many celebrities, television shows, U.S. Congressmen and museums over the years. Just a few are the tv. show "Lost", The "David Letterman" show, the "Madam Secretary" show, Tyler Perry Studios, Silver Man Picture and the BBC. Some of the people who have ordered from us are Tim Cook, CEO of Apple, one of his secretaries ordered it for him for his birth week. Also Edward Kennedy Jr. The Life magazine company even directs customers to us for vintage issues. We have an inventory of around 65,000 original issues of LIFE at any given time and have sold over 125,000 issues to happy customers. The largest majority of this collection has been built by buying from people who have contacted me and have had collections that their parents or grandparents have saved over the years. I travel the country buying from peoples attics and closets and have a great time doing it. I meet wonderful people and hear great stories about how someones parent or grandparent had saved every issue that they had received from an original subscription. Since I started selling LIFE magazines on the internet I have always believed that the thing that could set us apart from alot of other internet businesses is customer service. To me this means that a customer can actually talk to someone when they want to order or just have a question. Our phone number is 800-923-6433 and I am available to speak with even in the evenings and most weekends. We also offer a money back guarantee if not completely satisfied for any reason including the condition of the magazine. Please look at the "Our Magazines" link on the front page, there I describe our magazines. Please give us a try if you want a great gift of nostalgia for yourself or a hard to buy for loved one. We have had over 125,000 happy customers through the years and I get emails and calls all the time telling me how the magazine was a hit at a party or anniversary and even sometimes the most interesting gift that the person received. I will do my absolute best to make sure you have a great internet buying experience.